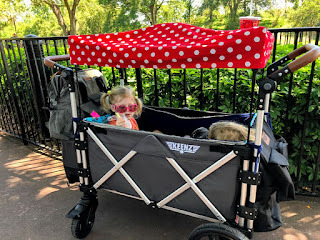 A couple of months ago we purchased a Keenz Stroller Wagon for our trip to Disney World. 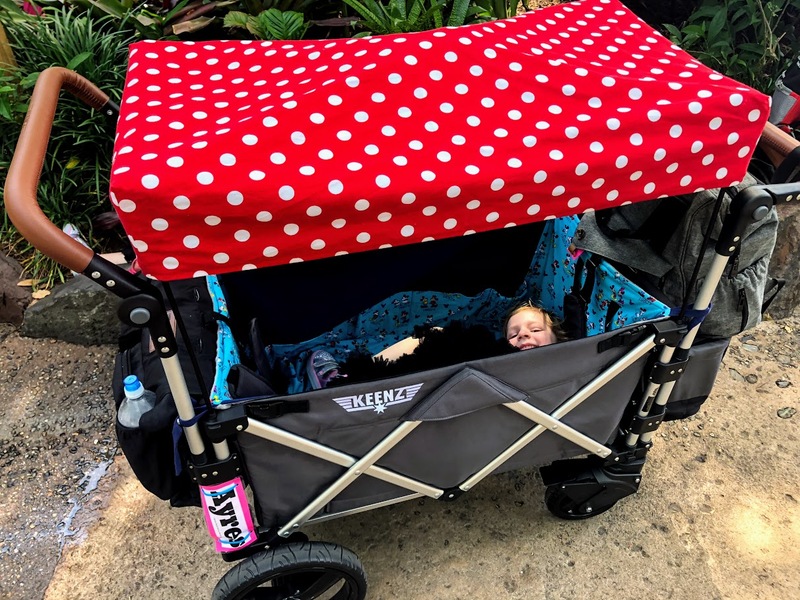 It’s a certified stroller that has many wagon like features. 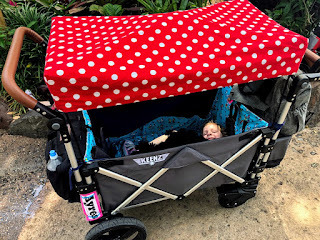 It makes a perfect stroller/child/child crap carrying device, I love it. There are quite a few Facebook groups where we all worship the Keenz. One of the bigger topics of conversation is handmade liners. 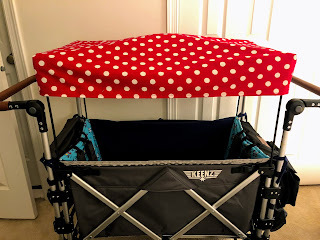 When I bought our stroller I tried to find a good detailed tutorial but there aren’t any out there. 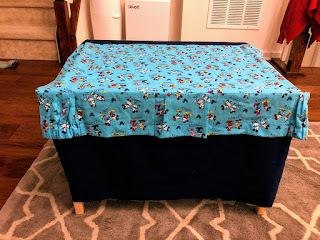 I am relatively proficient at sewing so I thought I would make my own pattern/tutorial and share it. As much as I would love to do something like this and sell it on Etsy to bring in some extra spending cash, I just simply don’t have the time to start a business. Here is my completed liner. I chose to do a full bucket liner, with snaps to secure it. There is one thin layer of batting. I also used the buttonhole feature on my sewing machine to make holes for the harnesses and the strap to close the Keenz at the bottom. It has a couple of pockets on the inside for the kids. Two for water bottles or sippy cups, and 3 for books, toys, snacks etc. 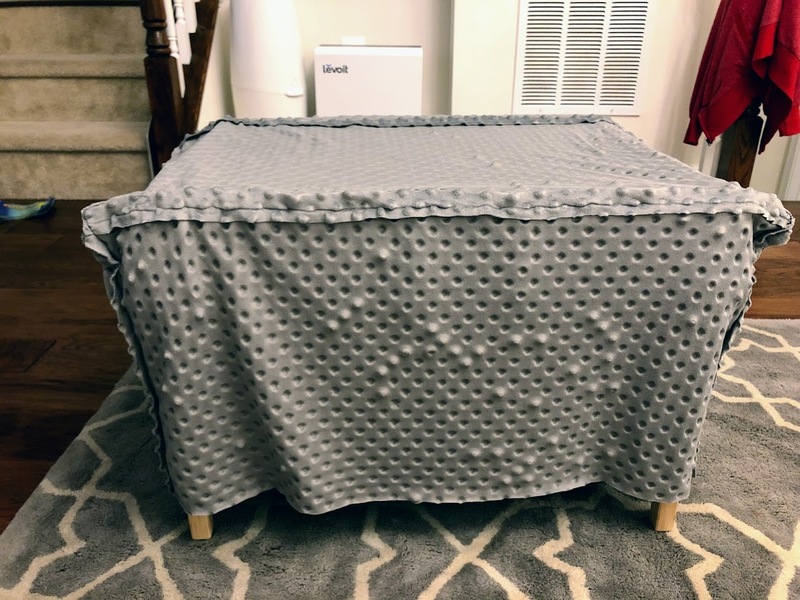 It is reversible with grey minky on the other side. I think the minky will be better for the cooler months since minky is so warm and cozy. There are NOT pockets on the minky side. 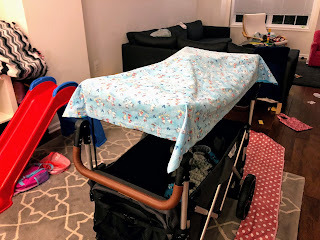 I also did a reversible canopy cover with some extra fabric I had. It was super simple and I LOVE how it looks. 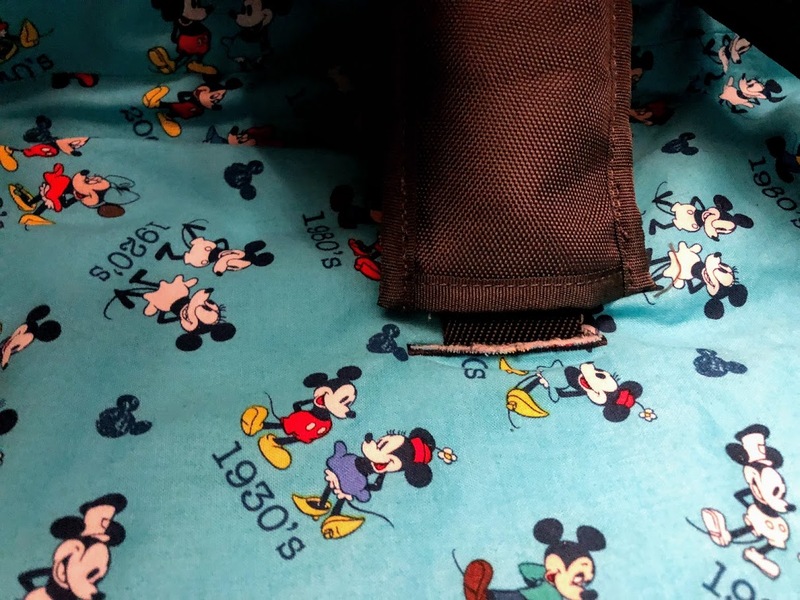 Update: Having used the liner and our Keenz for the past few months we rarely use the pockets on the inside and I think if I were to make another liner I would not make pockets again. This tutorial is LONG. Please do not be intimidated. There are a lot of steps, but if you take it slowly it should be easy to follow. 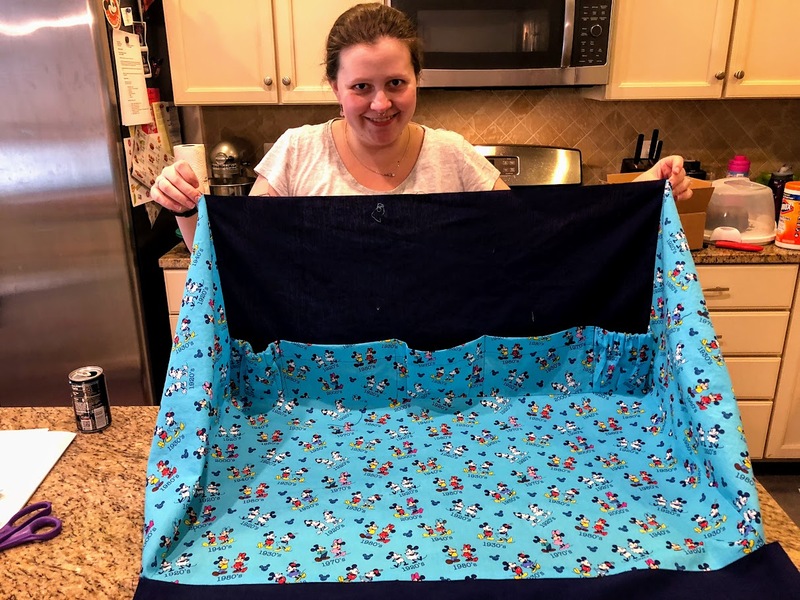 Sewing a full bucket liner is not a simple sewing project. It is pretty involved and I do not recommend it for people who are new to sewing. 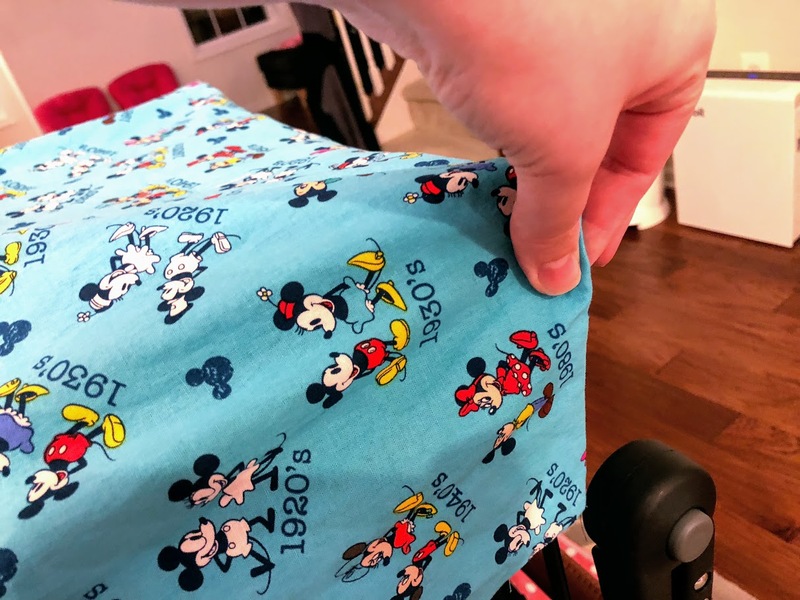 I purchased 4 yards of the light blue Mickey Minnie pattern fabric (I bought it online and ordered extra after I couldn’t find it at any local stores). I have about 1-1.5 yards leftover after the canopy cover. I also got 2 yards of the navy blue, 3 yards of the grey Minky. 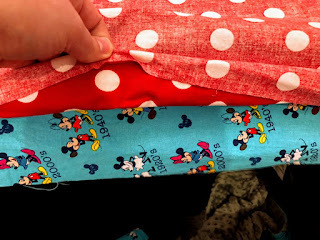 If you are planning on doing one color for one side and one color for the other I think 2-3 yards of each fabric would be enough. 4-6 yards total. If you are doing the canopy cover add 2 yards, 1 for each side. If I make another liner I will pick a thicker more durable fabric. 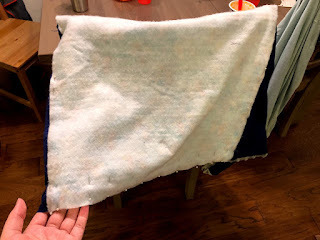 I LOVE the way the cotton turned out and it was very easy to work with, but it could use a little more structure and I think using a thicker slightly stiffer fabric might help. Make sure you buy 2 spools of thread. I only bought one and completely ran out by the end (the buttonholes used a lot of thread). Choose your batting, I bought something moderate. I thought about choosing something thicker but I didn’t want it to be too bulky when folding the Keenz. I also didn’t want it to be too hot. I only put batting on the bottom and the sides with the harnesses/straps. I don’t think the other sides of the Keenz need extra padding. 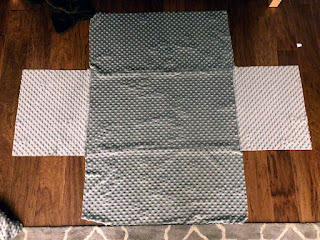 I purchased metal snaps that I hammered into fabric strips to secure my liner. You could do ties, or buttons. The snaps were really easy to install. 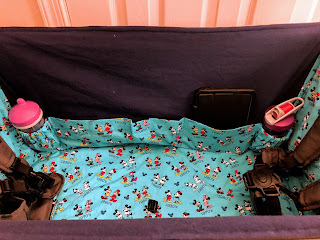 I love how easy they make the liner to secure and I don’t have to worry about them being easily undone by toddler fingers. I highly recommend buying a walking foot if you plan on using minky. 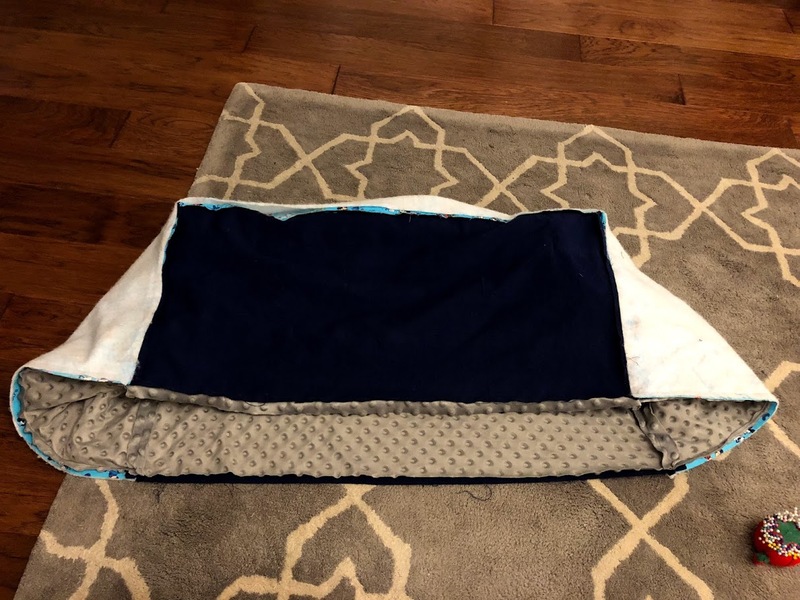 Having sewn minky with and without a walking foot before, without is a HUGE pain and I would never sew minky without one again. Even with a walking foot you can get some slipping, so be careful. 1. 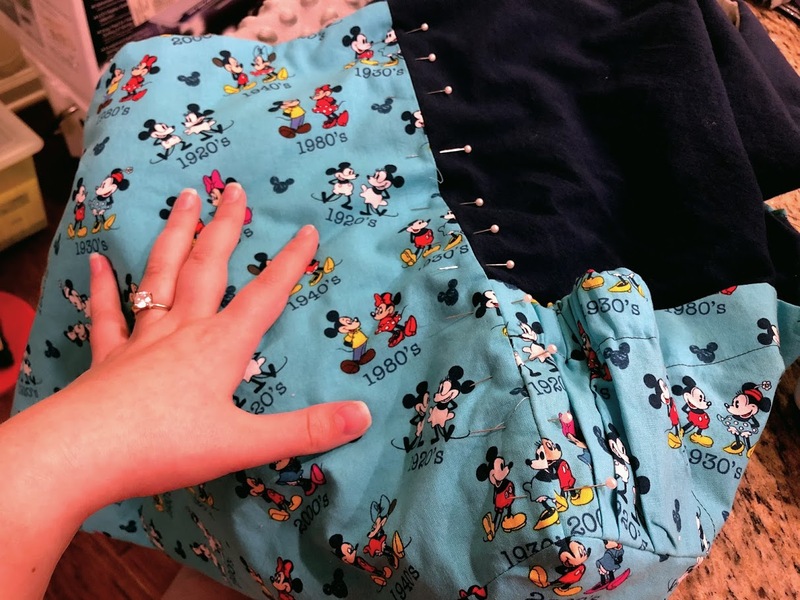 The first thing you want to do is measure and cut your fabric. 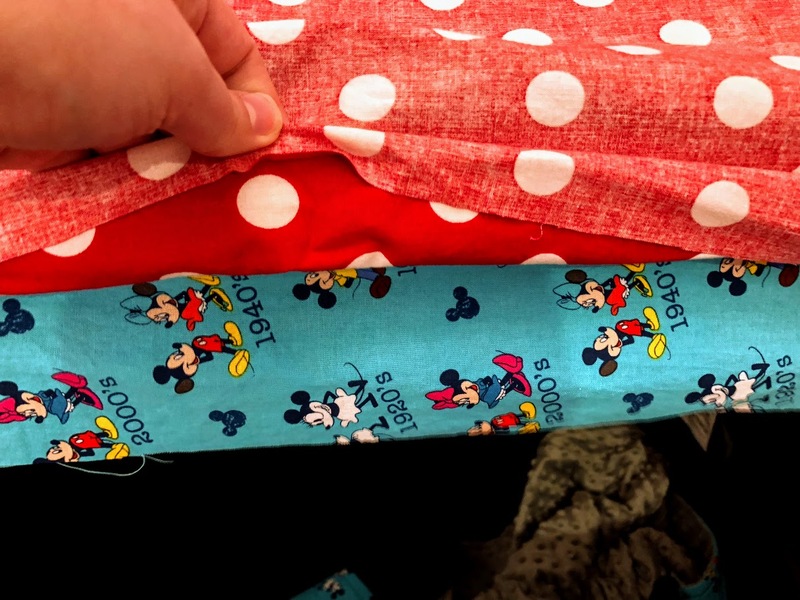 I cut the fabric for one side all at once, sewed it, and compared it to my Keenz before cutting the other side to ensure my measurements and my seam allowances were accurate. 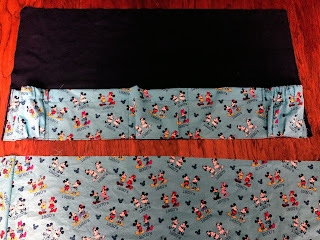 To get a better idea, I cut the Mickey fabric, and navy blue fabric, sewed it, then cut my minky fabric. My measurements account for a ⅝ inch seam allowance which was one of the guides on my sewing machine and it fit the Keenz perfectly. You will need these pieces cut in both the fabric used for the front of your liner and the back. Make sure when you are cutting your fabric out the print is facing the direction you want. I specifically wanted Mickey and Minnie facing up right on the back/harness pieces so I had to make sure they were cut properly. I cut my bottom piece 31 inches by 18.5 inches. 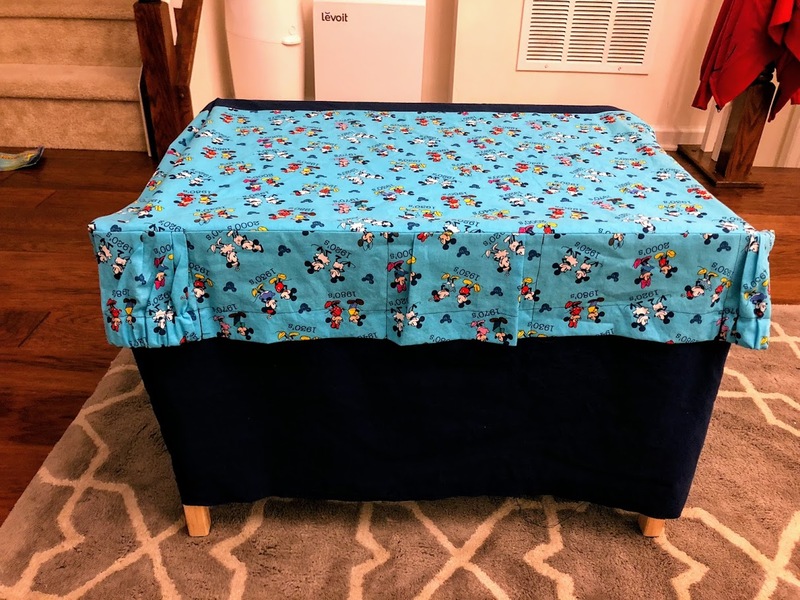 I cut this piece in blue Mickey and Minnie fabric, and one in grey minky. 2 sides where the harnesses go are 15.5 inches by 18.5 inches. 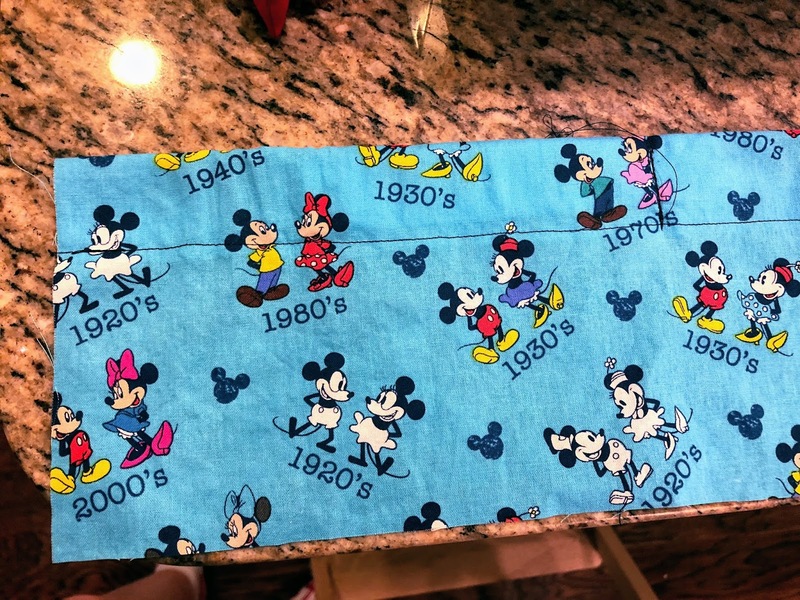 These pieces were also Mickey and Minnie and a set in grey minky. 2 long sides were 31 inches by 15.5 inches. These pieces I cut in navy blue, and two in grey minky as well. I added pockets to one side of the inside for the kids. That piece of fabric was 6 inches by 45 inches. 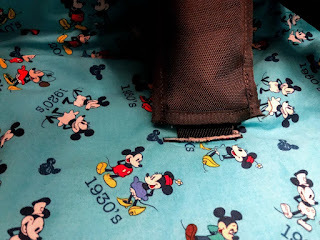 It was that large because it needs to accommodate for the gathered, elastic pockets for water bottles. 2. 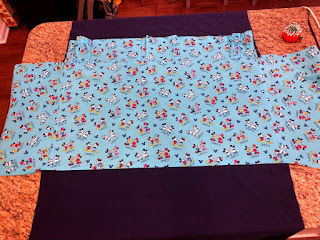 Once you have all your fabric cut out, lay it out and make sure you have all your pieces. 3. 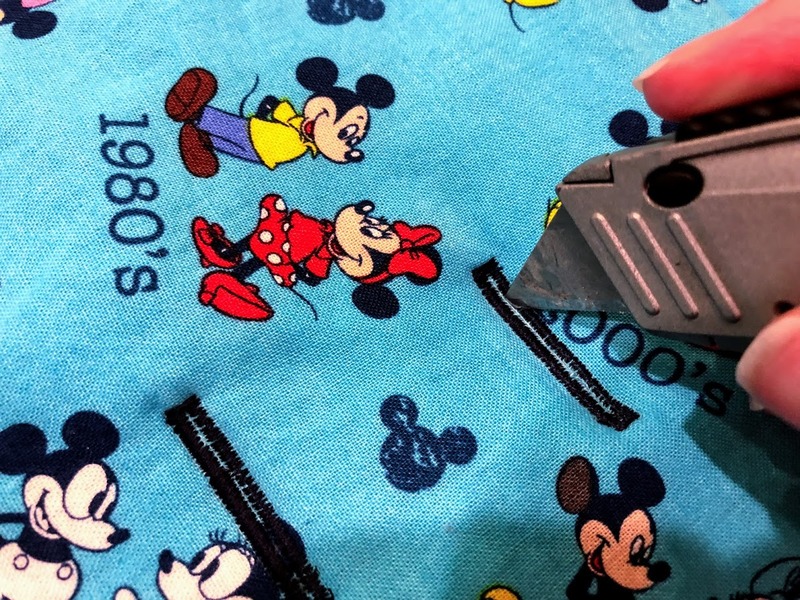 Grab a few scraps of fabric and make sure the tension on your sewing machine is correct before you start. 4. 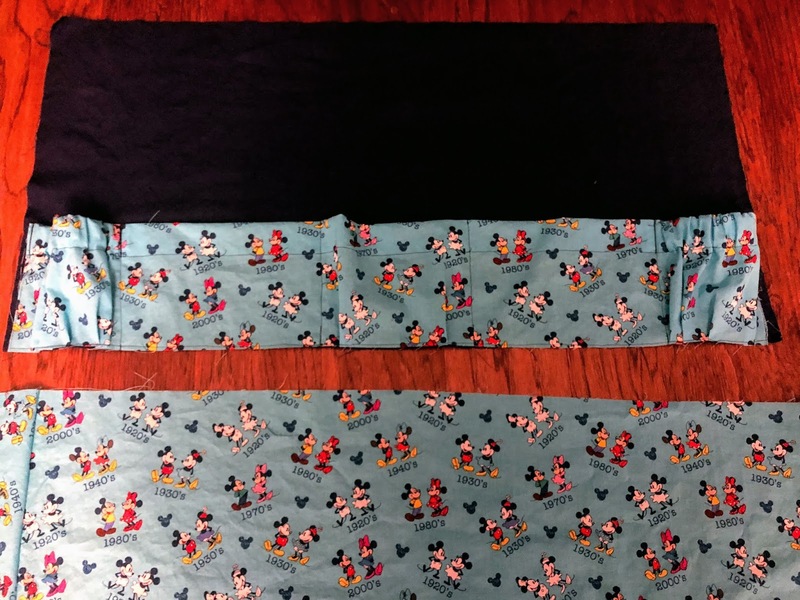 Start by sewing one of the harness pieces (measuring 15.5 by 18.5 inches) to the bottom piece (measuring 31 inches by 18.5 inches). Pin it right sides together and sew away. Repeat on the other side. 5. Take what you have sewn and compare it with your Keenz. If the seams don’t line up to the bottom adjust your seam allowances and continue. 6. At this point I created the pockets. 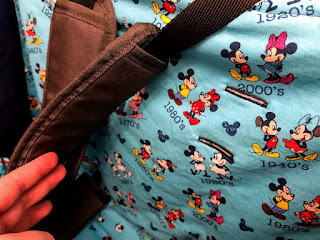 If you do not want to do the pockets go ahead and skip to the next step. I only had 1 inch wide elastic so I folded over about 1.5 inches and hemmed the piece of the of Mickey and Minnie fabric I had cut for the pockets (the piece that was 6 inches by 45 inches). I measured around one of our kids Camelbak water bottles to determine how long to make the elastic. To make things easier I just stretched a piece of elastic around a bottle to see how long it would need to be and hold securely but not so tight toddlers couldn’t get it in and out. fabric is not scrunched yet. After you know how long you want your elastic, measure it, multiply it by 1.5 or 2. Measure that far in on your fabric and stitch the elastic into the hem of the pocket piece. Scrunch up the excess fabric and stitch the end of the fabric to the end of the elastic to secure it. Stitch your pocket piece one of the pieces measuring 31 by 15.5 (for me this was one of the navy blue pieces). Start by stitching the far ends. Then decide how big you want your other pockets. Bunch your fabric accordingly. I was winging this part, so I am sorry if it is a little confusing. 7. 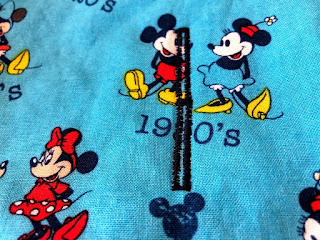 Once your pocket piece is completed, stitch it to the “bottom” piece of the liner make sure to pin them with the RIGHT sides together. 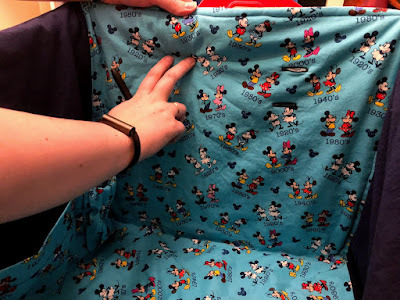 If you didn’t make the pockets stitch the piece measuring 31 inches by 15.5 inches. To the “bottom” piece. 8. Repeat step 7 and stitch the other piece measuring 31 by 15.5 inches to the “bottom” Piece to form a “t” shape. 9. At this stage you need to have your wits about you so make sure to triple check, before you pin and sew. Start sewing the seams to form the bucket. Make sure you have a big flat space to work. Take your time. I was lucky enough not to have to get out my seam ripper. This is definitely where you would need it if you do not pay attention to what you are doing. Make sure none of the fabric is folded or bunched up under itself. After one or two seams I compared my liner to my Keenz to make sure my seams were matching up well. Adjust your seam allowances if you need to. It will start to look like this. 10. Continue sewing all the sides to form a full bucket shape. 11. Repeat steps 1-10 with the other fabric for the reverse side of your liner. 12. Press all your seams. 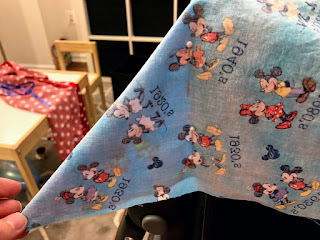 This step is not 100% necessary but it will definitely make things a bit easier (if you are using minky make sure your iron is not too hot or you will iron the little raised dots out of the fabric). Put Minky on top right sides together. 14. Pause before sewing the two sides of your liner and make ties. I cut 4, 2 inch wide strips that were about 15 inches long. Depending on how you want to attach your liner to your Keenz you might want them longer. Since I wanted to use snaps I made them a little long knowing I could easily trim them. If you plan on attaching your liner to your Keenz by tying them with bows they will definitely need to be longer. Then fold your strips of fabric in half long ways, iron them so they are easier to sew. Sew them with a small seam allowance. Leave one end open. Turn them right side out using a dowel, chopstick, or pencil, and iron them again (I didn’t finish off the end I left open until my liner was completed just in case I wanted to trim them). I added the snaps at a later time because I didn’t know exactly where I would need them to secure the liner well. 15. Pin and sew one of the longer sides together. NOTE: Continually check and make sure your seams are lining up. 16. Cut a piece of batting about 62 inches by 18 inches (I cut it a bit longer than necessary because I would rather trim than need to cut a new piece). Ties tucked into corners and pinned right were my hand is. 17. Pin your ties in to the 4 corners. Make sure to tuck them “inside” so when you turn the liner right side out they are where they should be. They need to be sandwiched between the two right sides of your fabric. 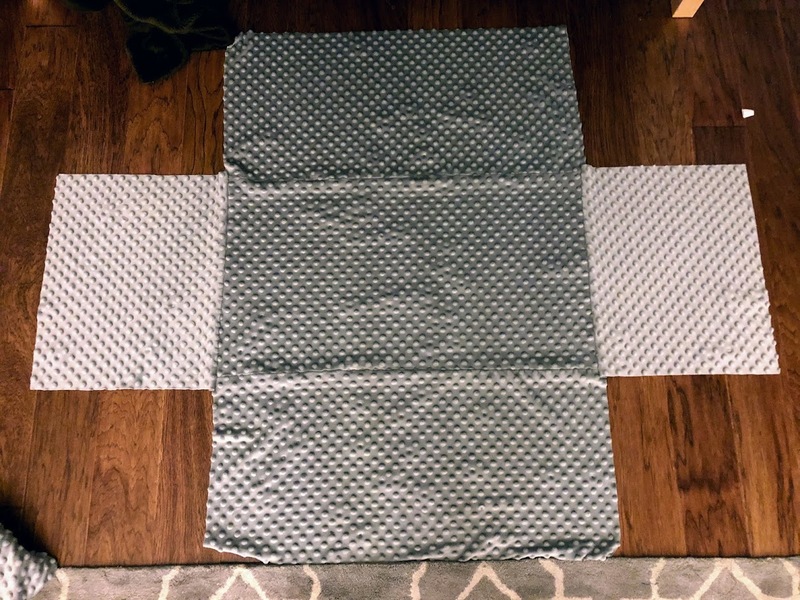 I folded my 4 strips in half so when the liner is turned right side out, each tie was “halved” and you then had 2 ties sticking out of every corner. 18. Pin the batting to your liner. Focus on the tops of harness pieces. 19. Sew just the top of the batting to your liner on both sides. You will secure the other parts of the batting later on. 19. Sew the top of the other long side together leaving a gap so you can turn the liner right side out. The batting will only be loosely secured at this point. 20. Turn your liner right side out. 21. Sew up the hole you left open, and sew around the top of the entire liner for a more finished look. 22. Very carefully line up the seams down the sides of the bucket where the batting is and stitch along the seams. Take your time, pin lots. Continue till you have stitched along all the seams. 23. Put your liner on your Kneez and get ready to do a million buttonholes. 24. At this stage I added the snaps to my ties, so the liner would be attached the same way every time I made a hole. 25. My sewing machine came with a buttonhole foot, and instructions on how to sew a buttonhole. I took a few scraps of fabric and made a few test buttonholes before trying one on my liner. The max buttonhole width my sewing machine is capable of, is JUST big enough to fit the harness straps. The buckles do not fit, but the other end where you attach the buckles to the Keenz frame fit. For me that worked. If you want the holes larger I will show you how to make them bigger in step 29. The big buckle at the bottom of the harness needed a larger button hole than all the others. 26. Put your liner in your Keenz with the harnesses removed. Do your best to feel where the holes need to be and mark them with a fabric marker or pen of some sort. harness. then making with pen. 27. Using your buttonhole foot, sew a buttonhole where you marked. Take your liner back to your Keenz and make sure was in the correct spot before using a sharp knife to carefully cut the fabric left between the stitches to create the hole. 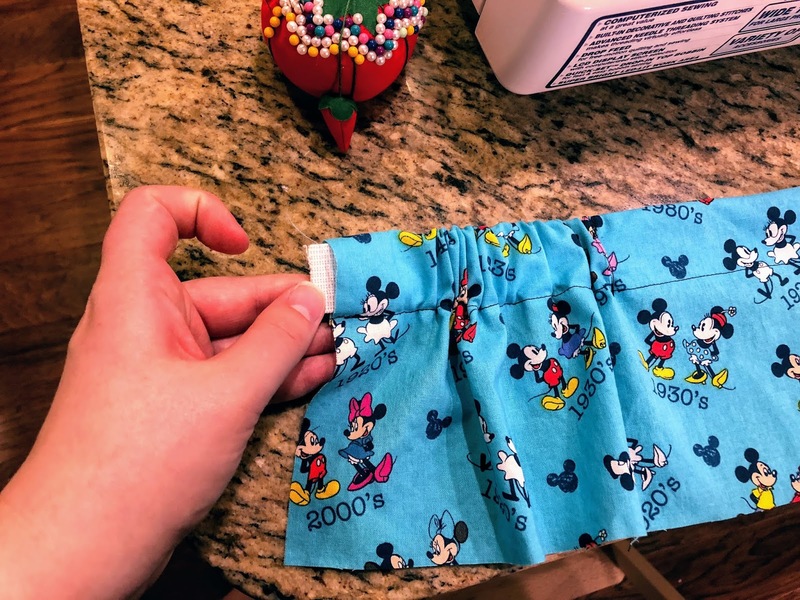 Note: After you have sewn the buttonhole(s) make sure you put your liner on your Keenz to make sure it’s in the correct spot before cutting the fabric to create the hole. 28. Repeat steps 26 and 27 till you have made 6 holes for each harness side, and one for the center bottom closure pull. (13 total). I did not create holes for the highest harness holes. 29. To make the wider buttonhole for the bottom buckle of the harnesses, I pretty much sewed two button holes back to back. I set the buttonhole length/width on my machine slightly less than the max, because the maxed doubled was too long. I stitched one hole, then reset the foot (my foot is spring loaded all I had to do was lift the foot it would spring to the start position, and sew a new hole right next to the first). When you cut the fabric for the big buttonhole you do have to cut through the stitching in the middle where the two buttons meet. I did a few hand stitches to secure the loose threads from fraying. Bellow is a photo of the finished wide button hole with the bottom buckle of the harness through it. That’s it for the bucket liner! I am very proud of how it turned out! Feel free to comment with any questions! 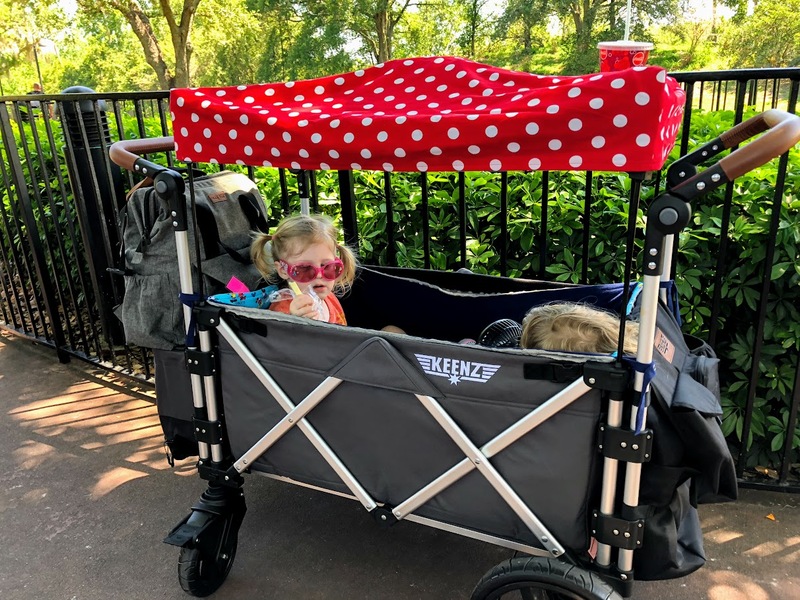 Here are some photos of our Keenz and liner in action at Disney world! About 2 yards of fabric. 1 yard of one print and 1 yard of another. 1. Cut a rectangle about 30 inches by 46 inches out of each print. 2. Drape one rectangle over your Keenz. Make sure it is even all the way around. Also make sure the print is facing DOWN. 3. Pin the corners relatively snuggly. 4. Sew each corner where pinned. This is not very exact but I found it a quick easy way to do the cover. 5. Turn the stitched cover right side out and put it on your Keenz. Check the corners, If you need to take them in a little bit adjust the seams as needed. I felt like this corner was a little too loose so I took it in a little. 6. Repeat steps 2-5 with the other rectangle of fabric for the other side. 7. Place both rectangles on the Keenz canopy and make sure the seams match up well. 8. Trim the excess fabric in the corners, and press the seams. 9. Pin the two sides of the canopy liner RIGHT sides together. 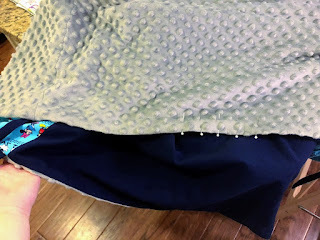 Stitch along the edge, make sure to leave at least a 4 inch gap to turn the cover right side out. Both sides of canopy on canopy right sides together. I just made sure the edges lined up well before sewing. 10. Turn the cover right side out. 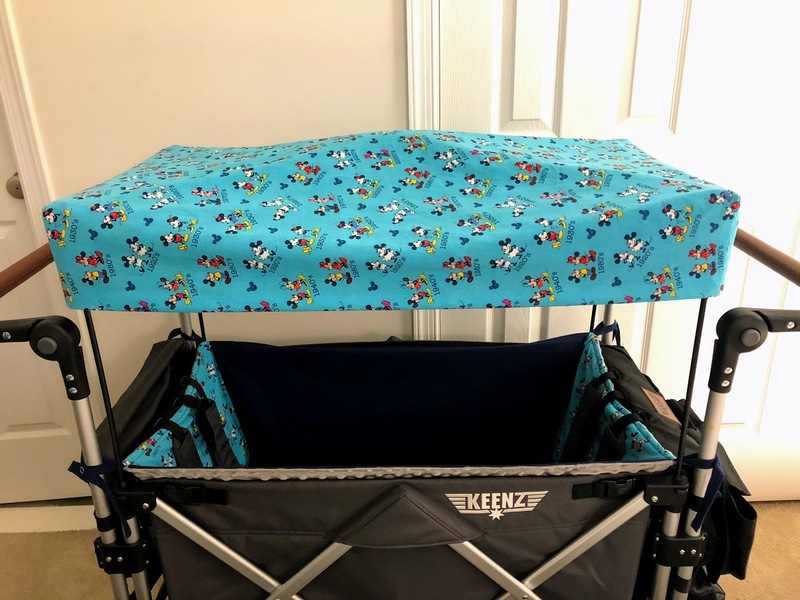 Check to see how fits on your Keenz if you need to make any adjustments turn it inside out again and fix it. 11. 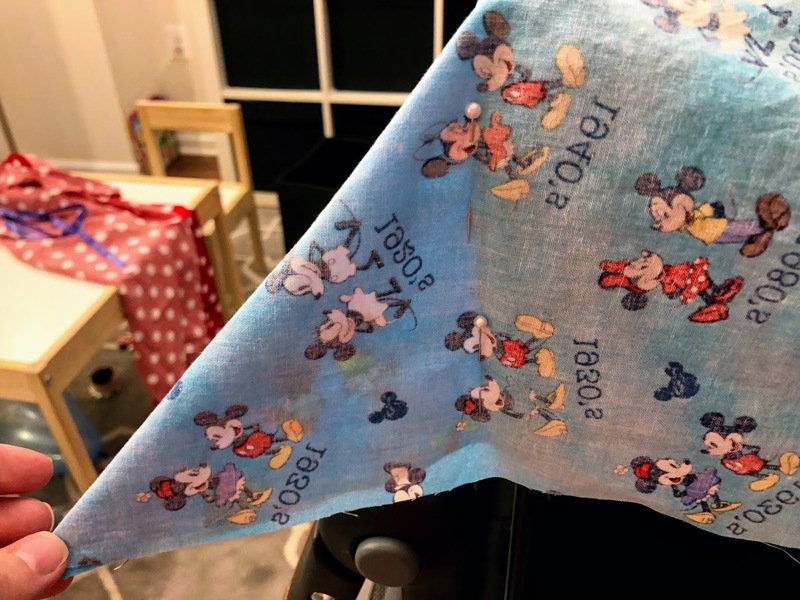 Iron the seams, and do a final stitch around the edge to give it a finished look. That’s it! I really love how the canopy cover turned out. It was the easiest part of decorating my Keenz and it looks great.